Will IoT help to build a smart India? IoT has the potential to bring about the next industrial revolution and to transform society, establishing a new ecosystem to serve humanity. In an IoT enabled world, people will receive uniquely personalised services, on demand, while societies will benefit from optimised resource use with minimal impact on the environment. It’s an exciting time for entrepreneurs entering the field of electric mobility, because the way people and goods will move in the near future is being revolutionised across the globe. The Industrial Internet of Things enhances manufacturing and industrial processes. Let us find out how. With several initiatives undertaken by Central and state governments to encourage the use of renewable resources, the solar energy sector has gained significant momentum and attention. This has dramatically increased the demand for solar charge controllers. OCEO: A smart water purifier that costs almost nothing! The quality of drinking water is something that no one can afford to compromise on. Water borne diseases like diarrhoea, hepatitis, typhoid and cholera, or illnesses due to contaminants like arsenic and lead, cause widespread health issues in India. Reports suggest that over 10,000 lives were lost to these diseases between 2013 and 2017 across the country. To monitor water quality and reduce contamination, smart sensor based technologies and filters are being used, but these often lead to high capital costs for consumers. To address this challenge, the Bengaluru based startup, OCEO Water, founded by Mahendra Dantewadiya, Rajeev Krishna, Vikram Gulecha and Hasmukh Gulecha, has developed a technology that detects, purifies, measures and monitors drinking water – all at zero upfront cost and with virtually no maintenance costs. Users pay just Re.1 per litre of water consumed! The components used in printed circuit boards (PCBs) are sensitive to a host of environmental conditions that can have far-reaching consequences and ruin the entire electronics assembly. The correct application of conformal coatings ensures the reliability and long shelf life of these components. "As a fraction of its GDP, India underspends on research and development"
The great Indian smartphone game is getting more interesting, day by day. Foreign players are finding themselves investing a lot more in India—for manufacturing, design or R&D. Recently, Oppo launched its latest R&D centre in Hyderabad—its first R&D unit in the country. So why did Oppo choose India as an R&D destination? What would be the scope of work from here? What are the plans going forward? Paromik Chakraborty of EFY Group caught up with Tasleem Arif, VP and head - R&D, Oppo India, to get all these questions answered. "The government should simplify the process of setting up manufacturing plants in India"
India’s consumer electronics market is highly competitive, with big and small players entering the domain regularly. Yet, India has barely touched the tip of the iceberg in terms of domestic manufacturing. Manoj Kumar Pansari, chairman and managing director, Astrum, speaks with Baishakhi Dutta of the EFY Group about the challenges and expectations of an ACE (appliance and consumer electronics) player who is ready to start manufacturing in India. "Technologies like AI and ML are giving a new direction to manufacturers in 2019"
India is gradually transforming into a potent and lucrative business destination for foreign players. The electronics industry is booming, with world-class work being done at the local level. Mitsubishi is a well-known brand that has identified great business opportunities in India and has expanded its B2B offerings in the country. Rajeev Sharma, head - corporate services and strategic planning for Mitsubishi Electric India Pvt Ltd, shares the firm’s plans and strategies for the Indian market with Baishakhi Dutta of the EFY Group. "India can be a big market for us, especially given its improving technology landscape"
The adoption of smart devices is increasing exponentially across the globe. 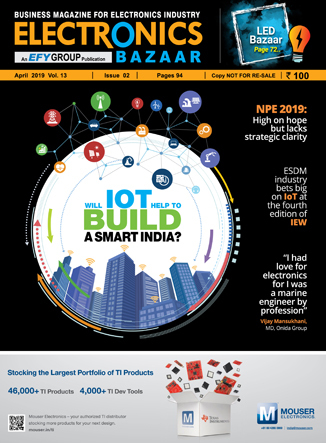 The Indian ecosystem is gearing up for smart city solutions, connected automotives and narrowband (NB) IoT applications. This transition has caught the interest of foreign investors. Jerry Cheng, supervisory specialist, Askey Computer Corp., talks to Paromik Chakraborty of the EFY Group about how the firm views the Indian market and its expansion plans. India is one of the fastest growing markets for electronics in the world. The electronics system design and manufacturing (ESDM) environment needs to grow a lot more to meet India’s domestic electronics demand as well as to build capacity to export. The National Policy on Electronics (NPE) aims to transform India into a premier ESDM hub. Introduced in 2012, the NPE has been significantly supporting Indian ESDM players. This February, an upgraded version – NPE 2019 – has been approved by the Union Cabinet, which promises to change the pace of growth. Today’s stencil printers have evolved into multi-function devices that also perform dispensing and inspection tasks. Process control and traceability connections are also offered, because the complexity of current electronic products demands better production processes. New schemes introduced by the government will focus not only on manufacturing electronics in India, but also on positioning the country as an export hub, a top government official said at MAIT’s Electronics Manufacturing Summit 2019. Light emitting diodes (LEDs) will continue to replace incandescent bulbs due to their environment-friendliness, energy-saving features and their cost-effectiveness. LEDs have now been widely accepted by the market, following a slew of government schemes to promote their use. The LED lighting market’s rapid development has led to an increase in demand for LED placement machines and LED production equipment. Here, we take a quick look at some of the latest machines. Energy Efficiency Services Ltd (EESL) has earned nearly ` 30 billion through the Unnat Jyoti by Affordable LEDs for All (UJALA) programme in the past four years, as per a report in www.thehindubusinessline.com. Cree has launched the next-generation XLamp XP-E2 photo red (660 nm) and far red (730 nm) LEDs for horticultural applications, which increase the efficiency of LED luminaires and shorten their payback periods, making it more affordable to grow food under optimised lighting. ©2019 EFY Enterprises Pvt Ltd. All rights reserved.